Lineup - Tim Berne: alto saxophone; Oscar Noriega: clarinets; Ryan Ferreira: guitar; Matt Mitchell: piano; Ches Smith: drums, vibraphone, percussion + guest David Torn: guitar. Credited for developing an adventurous work within the hard-line of contemporary jazz for almost four decades, alto saxophonist Tim Berne has created almost incessantly since 2012 to feed the repertoire of Snakeoil, a group whose core members are Oscar Noriega on clarinets, Matt Mitchell on piano, and Ches Smith on drums, vibraphone, and percussion. The band’s fourth ECM outing, Incidentals, also features for the second time Ryan Ferreira on guitar (he was in the previous You’ve Been Watching Me), and counts on the atmospheric guitarist and producer David Torn on a couple of tunes. His soaring guitar prevails in the intro of “Hora Feliz” (the Portuguese title means ‘happy hour’), a tune that before expressing an ebullient extravagance through melodic unisons of sax and guitar, remains nearly four minutes in a sort of atmospheric limbo layered by clarinet, piano, vibraphone, and a shrilling guitar. Buoyed up by Berne and Noriega’s improvised narratives, Mitchell ekes out a variety of extemporaneous harmonic responses, always well backed by Smith’s polyrhythmic punch. “Stingray Shuffle” starts a crawling process with Berne and Ferreira attempting a deliberately inexact unison turned into thin polyphony. The mood becomes viscerally spectral as a panoply of prolonged, multi-instrumental screeches haunts the scenario, right before the triumphant reinstatement of the theme. Delightfully inventive and full of twists and turns, “Sideshow” occupies our attention during the 26 minutes it lasts. Never superfluous, this dazzling piece offers us plenty to chew on, from crackling, distorted guitar sounds (Torn is called into action) to the wonderful piano work by Mitchell, and from diversified rhythms and tempos to well-oriented horn-driven paths. The band works conjointly and tightly toward a grandiose epiphany that culminates in a serene auroral beauty. The confident, action-packed “Incidentals Contact” is first activated by Smith's magical vibes but ends up navigating in those thrilling roundabouts engendered by Berne and amplified by powerful drumming. It develops a complex matrix that thrives with echoing rock momentum as it showcases the Stentorian improvisational skills by the bandleader and Mitchell, followed by a brief and hermetic interplay between Noriega and Ferreira. The last track, “Prelude One / Sequel Two”, is also one of the most exciting pieces, consisting of two parts seamlessly connected. The prelude, co-authored by Berne and Mitchell, flows at a steady pace with melodic zigzags. The sound is then expanded and transformed into a swollen sonic mass for the sequel, where Berne’s intoxicating inflections are like blazing emotional outbursts. It’s a tour de force finale that makes you cry for more. 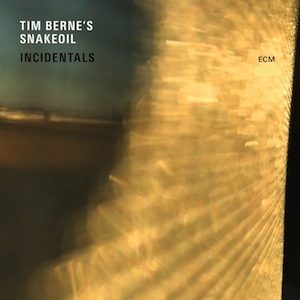 Tim Berne continues his sparkling creative saga with the Snakeoil, digging another taut album full of nerve, audacity, and mutual inspiration.